The Bible indicates that the Antichrist will rise to power after a confederacy of ten kings. Apparently, he will have a power struggle with three of the ten kings, and emerge as dictator over the "fourth kingdom" described in Daniel chapter 7. Nonetheless, his dictatorship is short lived, when the Messiah comes to destroy the fourth kingdom and set up an eternal empire. In the sequence of kingdoms describes in Daniel 7, four world empires rise up, one after another, in sequence. This succession of the rise and fall of four great world empires is documented in both Daniel 7 and Daniel 2. From these passages, we know that the first empire is the Babylonian empire. The imagery of the second and third empires correspond well to what we know of history. The fourth kingdom in the sequence was the Roman Empire. However, God destroys the fourth kingdom to set up an eternal kingdom, where all rulers obey him. Since the Roman Empire was the fourth kingdom, many theologians believe that the Roman Empire is required to come back into existence in the end times in order for prophecy to be fulfilled. (To learn more about the end times Roman Empire, CLICK RIGHT HERE). Since ten kings come from this end times Roman Empire, many Bible teachers and theologians believe that the end times kingdom will be composed of a ten nation alliance in the geographic area of the old Roman Empire. The Antichrist rises to power among this confederacy of ten. Apparently (according to the Scripture quoted above) he has a power struggle with three of the ten kings. (CLICK RIGHT HERE to learn more about this). 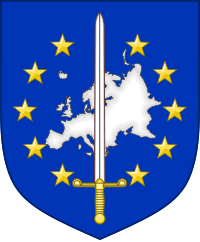 The Western European Union was a military alliance of 10 member states. It was not part of the European Union, but worked closely with it. It formed the basis of today's "common foreign and security policy." Gradually, the functions of the WEU were transferred to the European Union. Finally, in 2011 the treaty was terminated and replaced by defensive pact within the Lisbon Treaty. This alliance of ten nations in the historical area of the Roman Empire formed the historical framework for the EU's common security and defence policy. If you click on THIS CHART, you can see the gradual merger of the WEU into the EU, under the common foreign and security policy. The WEU alliance, after serving valuable functions for 15 years, became obsolete in 2011, due to the Treaty of Lisbon mutual assistance clause. However, analysts and journalists are well aware the the EU does not have a genuine "common policy" on defense or foreign policy matters. The member nations are too wrapped up in their own national interests. Many analysts and bloggers bemoan the EU's lack of "one voice" on the world stage. One big reason for this is the influence of the "big three" countries: France, Britain and Germany. 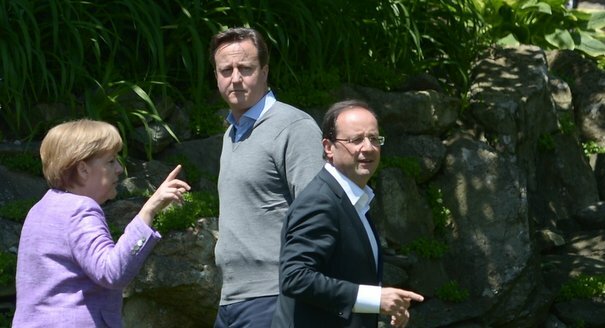 They have sometimes worked together as three in order to influence EU policy. They have even been accused of a "power grab" in the past. One particular issue where they wanted to maintain control of foreign policy was in the area of negotiations with Iran over it's nuclear program. Javier Solana, the then EU Foreign policy chief, had to struggle with these for influence. They did not want to turn these negotiations over to the EU, but wanted to control them. All in all, Javier Solana ultimately replaced them in negotiations with Iran in this small foreign policy battle. The late Herbert L. Peters was the man who originally discovered the basis for the prophecy theory advocated on this blog (and other blogs). He did a lot of research into Javier Solana, the EU Big Three and it's significance. Nevertheless, that was almost 8 years ago. I hadn't heard much of the EU Big Three, so I assumed their influence or prophetic significance had waned. But alas I was wrong. Analysts and journalists continue to think they are a very influential group, and have in some ways blocked the creation of a genuine common foreign policy. 1) In 2012, Carnegie Institute writer Stefan Lehne came out with a very large research article called "The Big Three in EU Foreign Policy." The leadership role expected from the EU foreign policy chief is constrained by member states’ national reflexes. The strategic debate on the future course of the EU as a global actor – a tricky subject – was not only avoided by Ashton, but also by Britain, France and Germany, and thus by the only ones that are able to give momentum to Europe’s foreign policy. In Ashton’s defence, member states – not least due to the sovereign debt crisis – had little interest in foreign policy matters in recent years, let alone were eager to start a wider strategic reflection process. Did you catch that? It talks about the ten kings having a "common purpose" and giving their royal power to the beast. This is in context of the destruction of the end times city of Babylon. So it seems they have some kind of common purpose on military matters. The identity of the end times Babylon is irrelevant for purposes of the discussion here. Whatever city it is, the ten kings unite in a "common purpose" to destroy her. They do this by giving their kingdom to the beast until God's words are fulfilled. And remember, the ten horned beast in Daniel represents the Antichrist's kingdom. In Revelation, the ten horned beast represents the Antichrist or his kingdom, interchangeably. "Common Security and Defence Policy"
"Common Foreign and Security Policy"
The 10 nation Western European Union, according to the EEAS website, was the historical framework for the "common security and defence policy." You're probably thinking. "But wait! You just got done telling us that the EU doesn't have a genuine "common policy" on defense. After all, the analysts bemoan the lack of unity in this area. Defense is the EU's absolute weakest area!" And that's exactly it. They are taking baby steps to a "common purpose." First through the history of the WEU, where it gradually merged into the EU (after formerly taking responsibility for EU defense matters). Then, a political position (the high representative) that gradually gains influence over the ten in foreign policy matters. Then, a dissolution of the ten into the larger EU "beast." In 2011, the alliance deemed themselves unnecessary and redundant, claiming to have accomplished their historical role. The EU does not have one voice. But which three stand in their way, even ten years later? The "Big Three" according to analysts, are the one's who pose the obstacle to a common EU foreign policy. It's no coincidence that they struggle against the EU in military matters. The Big Three....are alive and well.